By threatening to withhold his vote for the final compromise, Massachusetts GOP U.S. 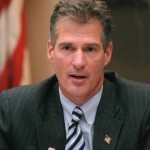 Senator Scott Brown (l.) got the Democratic negotiators on the financial regulatory reform bill to delete a $19 billion fee on large financial institutions to cover costs of implementing the new law. Law Professor Cornelius Hurley, director of the Morin Center for Banking and Financial Law and a former counsel to the Fed Board of Governors, says the Dems missed the boat by labeling the charge a “tax,” making it vulnerable to read-meat ideological attacks.